Invacare Reduced Gap Full Length Bed Rail features durable, 7/8" chrome-plated, welded steel construction that provides durability and clean-looking finish. It can be installed permanently or semi-permanently on all spring-fabric medical-style beds. This rail is designed to withstand heavy-duty use for increased product longevity. The spring-loaded, self-adjusting crossbraces snap into place without tools. Invacare Bed Rail can be installed on the following Invacare Beds: 5307IVC, VC5210, VC5310, 5310IVC, 5410IVC, 5410LOW. How to use Invacare Reduced Gap Bed Rail? Extend one bed rail to reach the head end and foot end crossbraces. Insert the outer telescoping tube of the bed rail into the barrel of the head end crossbrace. Pull and hold the plunger knob on the barrel while lowering the bed rail. Release the plunger knob on the barrel. Raise or lower the bed rail until the plunger pin clicks securely into the adjustment hole or until the bed rail stop rests against the barrel. Insert the inner telescoping tube of the bed rail into the barrel of the foot end crossbrace. Repeat Steps 3-5 for the inner telescoping tube of the bed rail, adjusting the bed rail to the position reached in Step 5. Repeat Steps 1-7 to install the other bed rail onto the opposite side of the bed. Hold bed rail while pulling the plunger knob. Release plunger knob and lower/raise the bed rail until the plunger pin clicks into position unless the bed rail is at the lowest position. Rail Height Above Deck Raised 14.5"
Rail Height Above Deck Lowered 4.25"
We currently have model #5000IVC with rails like those that appear as Item #6629(they're silver). The weld broke on one of the bars that are located under the mattress that holds the rails. Do they sell parts or do I need to buy a new set? If I have to buy a new set is this item #6629 the one that will fit this bed? 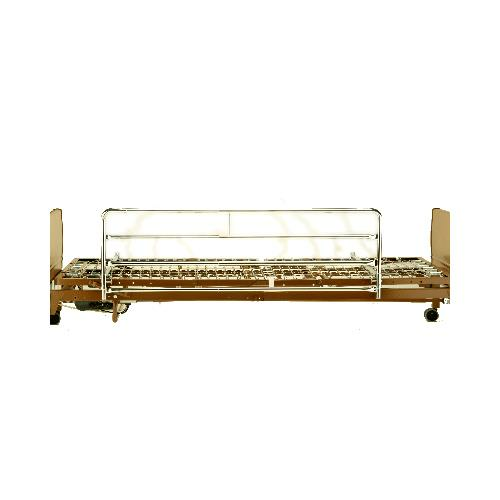 All invacare rails can be installed permanently or semi-permanently on all spring-fabric medical-style beds.